As you may already know, I have partnered with Harvesters Community Food Network this year to highlight one of its campaigns: #Hungry4More. Food has always been a significant part of my life. Some of my earliest and fondest memories are centered around food. From cooking and eating with loved ones to posting my favorite meals on the ‘gram. However, there comes a time where you must step outside of yourself and your full pantry to realize that food insecurity is a real life epidemic that impacts 1 in 7 people* in our area. If you are unfamiliar with food insecurity, that means an individual might have a meal today but is uncertain of where or how they will feed themselves tomorrow. 1 in 7 people in Harvesters’ 26-county service area (with counties in both Kansas and Missouri) is food insecure. Imagine eating breakfast: shoving bites of waffles and eggs into your mouth, knowing that lunch, dinner and even tomorrow’s breakfast is a meal you may not have. I absolutely love root vegetables. Not only are they some of the most affordable garden goodies but are loaded with nutrients and minerals from growing underground. This recipe features a mix of carrots and beets but can easily be adapted for any variety of root vegetables. Another great thing about this class of produce is that they are very difficult to ruin. You can pop them in your oven, literally forget about them and still have an edible end result. 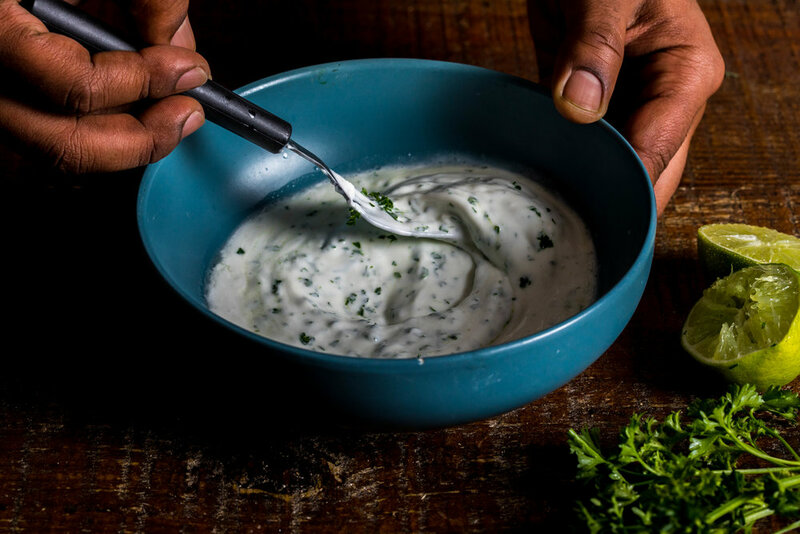 Paired with a simple citrus, yogurt sauce, this dish is a tasty fool-proof side or entree perfect for your holiday feast. During this time of the year, full of holiday cheer (I did not intend for that to rhyme), it is imperative that we do not forget about those who are less fortunate. Taking action with Harvesters is as easy as 1-2-3-4: giving money, giving time, giving food or giving voice. How will you assist in the fight against hunger? Empty Siggi's plain Skyr into a bowl. Roll lime using the palm of your hand and a flat surface. This will break open the inner juice capsules, making it easier to extract juice once cut open. Slice lime in half and squeeze juice directly into bowl. Finely chop parsley leaves and discard stems. Add chopped parsley to bowl. Mix until smooth and consistent. Chop off the tops of vegetables and discard. Wash vegetables thoroughly under cold water. Allow vegetables to dry then cut in half. Place split vegetables in a bowl or on a sheet then lightly drizzle with olive oil. Use only enough olive oil to coat the vegetables. Place vegetables on a sheet rack then place in oven. Roast vegetables for an initial period of 20 minutes. Flip vegetables then continue to roast until all vegetables are tender and brown in spots, turning occasionally. I prefer my vegetables a bit more firm than most and allow them to roast for another 20 to 25 minutes. Serve atop the the Lime Yogurt Sauce. *Vegeta is one of my favorite go-to seasoning mixes. If you do not have any on hand, simply mix 1 tablespoon of garlic powder, 1 tablespoon turmeric, 1 tablespoon of onion powder, 1/2 tablespoon of salt, 1/4 tablespoon of pepper for a quick substitute! This post is brought to you in collaboration with Harvesters Community Food Network. The opinions are all mine. Thank you for supporting the brands that support Kasim Hardaway!